Weirdbook.org - March 29, 2012: Who wants to be a mega millionaire? Who wants to be a mega millionaire? Posted March 29, 2012 @ 21:47:50 EDT. The Mega Millions jackpot has reached 540 million dollars. A ridiculous amount of money, to be sure. 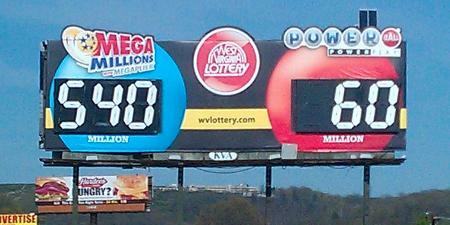 That number is going up, by the way... with no winner Tuesday night, the jackpot was at 465 million Wednesday morning. By noon it was up to 500 million. As of noon today, the magic number was revised upwards yet again. By the time the drawing rolls around tomorrow night, it could be 600 million or even higher. Over half a billion. That's a lot of lettuce. Did I buy a ticket? No, I bought ten of them. Do I expect to win? Not really. For the record, I minored in math in college and am fairly well-versed in probability. I know, logically, my odds of winning are the same regardless of how high the jackpot is, and practically the same regardless of how many tickets I buy within reason. My ten tickets (extravagant by my standards, by the way) give me a 0.0000057 percent chance of winning versus 0.00000057 percent, and if you're having to count those zeros to see where the difference is it's close enough to zero to not even matter. But come on. 540 million bucks? I'm ok with taking a ten dollar gamble on what could be a huge payoff. Several years ago, I ran through some calculations and figured out that with a little under a million dollars, I'd be set for life as long as I didn't do anything stupid. As I recall the Powerball jackpot had reached some astronomical level or another — probably paltry compared to the current record-breaking monster — and I was curious how much it really would take. Since then, things have changed a bit. Interest rates have dropped to virtually nothing, there's another mouth to feed, and I now prefer fancy ice cream over the cheap stuff. So a million just won't cut it anymore from a "set for life" perspective. Mind you, I'm more than willing to test that theory. Though 540 million would probably get the job done better, and I'm more than willing to test that theory too. So... fingers crossed, four leaf clovers, rabbit's foot, and so forth.